Temple had hoped two weeks away from the field would help its offense gather itself and show some semblance of the team that opened the season racking up yards and putting up big numbers. That did not happen Saturday at Lincoln Financial Field in a 14-6 loss to Cincinnati. And if the Owls (5-6, 3-4 American Athletic) are going to be eligible for a bowl at the end of this season, they've got one week to get things corrected. "I think we can," quarterback P.J. Walker said. "We knew that this would be a huge win for us, and we played as hard as we could. But in the end it just didn't happen." The regular season concludes next Saturday at Tulane (3-8, 2-5), which has lost four of its last five games. Temple held the top-scoring offense in the conference well below its 37.3-point average. And the 255 yards in total offense Cincinnati (8-3, 6-1) amassed fell well short of the 547 it averages. But the Owls gained just 267 yards of their own against the Bearcats, who have won six straight. Trailing by 3-0 after one quarter, Cincinnati capitalized on a Walker fumble early in the second period that allowed it to overcome its inability to move the ball for most of the afternoon. On a first-and-10 play at the Owls 19, Leviticus Payne sacked Walker and picked up the fumble before being brought down at the Temple 3 by tight end Wanemi Omuso. That set up the first of two second-quarter Bearcats touchdowns, a 3-yard pass from quarterback Gunner Kiel to receiver Mekale McKay with 12 minutes, 39 seconds left in the first half. Running back Mike Boone also scored from 1 yard out with 28 seconds left in the half. "That was pretty much it," Temple tackle Matt Ioannidis said. "We played them tight the whole way. We were right there with them. It just came down to a play here and there." While the Owls were as efficient on defense as they have probably been all season, the offense continues to be lackluster, something that was magnified in the third quarter. After Austin Jones pulled Temple to within 14-6 on a 31-yard field goal with seven minutes to play in the third quarter, the Owls quickly took back the ball on the following kickoff, when Boye Aromire slammed into Cincinnati return man Chris Moore at the 20-yard line, jarred the ball loose, and recovered the fumble at the Bearcats 18. Facing third and 1 from the Cincinnati 9, Walker threw to an open Colin Thompson, but the ball soared just out of reach and cost the Owls what looked like a sure touchdown. Rather than go for it on fourth down, the Owls opted for a 27-yard field-goal attempt from Jones that sailed wide right. 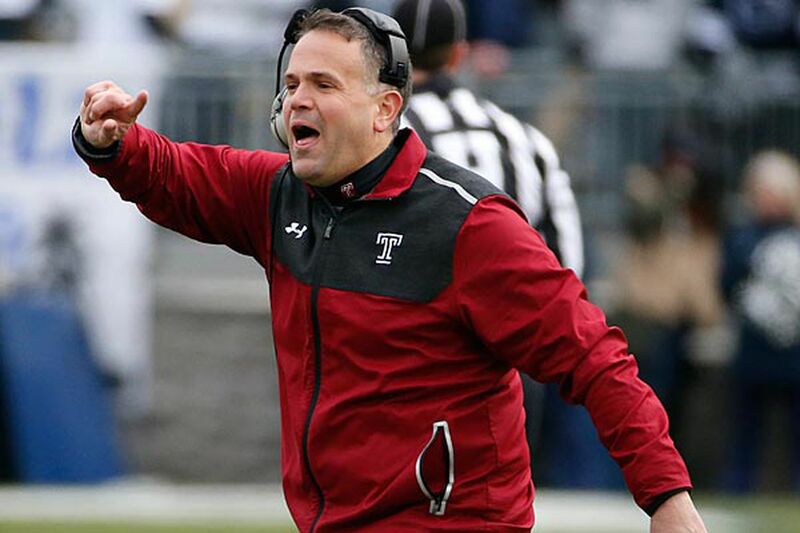 "We called it earlier from a different formation, and it was there," Temple coach Matt Rhule said of the third-down play. "At that point I decided to kick the field goal and make it a one-score game so we wouldn't have to go for two or anything like that. I just didn't think they were going to score against our defense."